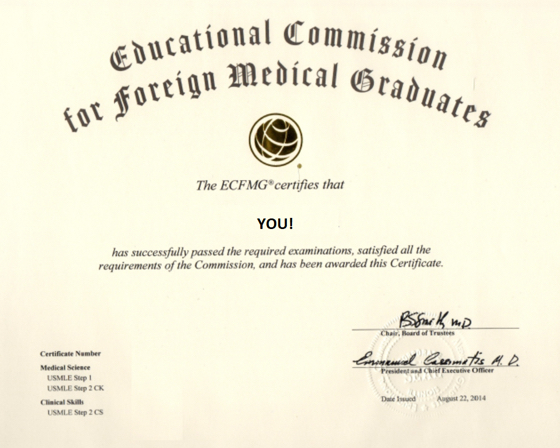 “The Educational Commission for Foreign Medical Graduates (ECFMG) was founded in 1956 to assess, through a certification program, whether International Medical Graduates (IMGs) are ready to enter residency or fellowship programs in the United States that are accredited by the Accreditation Council for Graduate Medical Education (ACGME)“ from ecfmg.org. The ECFMG basically serves as the Dean’s office for a international medical graduates (IMGs), ensuring that they are ready to enter graduate medical education and health care systems in the United States through an evaluation of their qualifications. Ultimately, it allows them to apply for the USMLE steps and then certifies the completion of the requirements needed to apply and undergo the residency match. Without an ECFMG certificate, an IMG cannot apply for an ACGME (Accreditation Council for Graduate Medical Education) accredited residency position. The ECFMG receives and certifies all the documentation necessary for residency application and then forwards this information to ERAS (Electronic Residency Application Service) at the time of application. What is an international medical graduate (IMG)? Any medical graduate that has obtained their medical degree outside of the United States or Canada, independent of their citizenship. Providing accessible information to international medical graduates regarding entry into graduate medical education in the United States. Assess the readiness of international medical graduates to recognize the diverse social, economic and cultural needs of international medical graduates to become acculturated into U.S. health care. Identify the needs of international medical graduates to become acculturated into U.S health care. Improve the quality of healthcare by providing research and consultation services to institutions that evaluate international medical graduates for entry into their country. USMLE Steps and ECFMG are separate and not the same thing - every medical graduate, US and international, has to complete USMLE Steps 1, 2CK and 2CS in order to apply for a residency position. Only IMGs have to go through ECFMG credentialing. You do NOT need to complete the USMLE Steps in their numeric order (you may start with 2CS, then 1 and complete with 2CK). Also, completion of USMLE Step 3 is NOT required for obtainment of the ECFMG certificate. Completion of the core clinical clerkships, including actual patient contact, is recommended but not required before taking Step 2 CK and Step 2 CS. 1. Apply for a USMLE/ECFMG Identification Number. Visit www.ecfmg.com → On-line Services IWA-Interactive Web Applications → Request for USMLE/ECFMG Identification Number. 2. Complete the application for ECFMG Certification. This is the initial application - the actual certification will be obtained once you have completed all the required Steps. The application is accessible through the On-line Services → IWA-Interactive Web Application, mentioned above. For the exact breakdown of all the requirements of the application, please visit this LINK. Varies depending on whether your medical school is part of the ECFMG Medical School Web Portal (EMSWP) Status Verification Program or not (for more information visit this LINK). If your medical school participates in the EMSWP Status Verification program AND your medical education credentials have been primary-source verified by ECFMG, you should complete “Certification of Identification Form (form 186) – Certification by Notary Public”. This form 186 is completed by the medical school graduate and either a Notary Public, Consular Official, First Class Magistrate or Commissioner of Oaths. The form should be sent to ECFMG by YOU. If your medical school does not participate in the EMSWP Status Verification program AND your medical education credentials have not been primary-source verified by ECFMG, you should complete “Certification of Identification Form (form 186) – Certification by Notary Public AND Medical School Official”. This form 186 is completed by the medical school graduate and either by a Notary Public, Consular Official, First Class Magistrate or Commissioner of Oaths, and by an authorized Medical School Official. The form should be sent to ECFMG from the office of the medical school official who signed the form. If you are already a medical graduate (not a medical student), you must also must submit copies of your medical diploma (and translation) with the exam application. Applicant status as a medical graduate must be verified directly by their medical school. If you are a medical student, you can submit the above mentioned paperwork later. 4. All set - Take your USMLE Steps! Complete an application for USMLE examination HERE. In theory: You can apply to programs and participate in the match without having everything ready (diploma, Step 1, Step 2 CK and Step 2 CS). You will be able to submit a rank list as long as you have your ECFMG certificate by the NRMP ranking deadline, roughly a month before Match Day (usually mid March). In reality: Do not expect programs to send you an interview invitation without an ECFMG certificate. Program directors want to make sure that you are ready to start and that your scores are available. It is still possible to get interviews without a complete application, especially if you approach the program directors, explain your situation and keep them updated about when you’re taking your exams, although this is quite rare and usually only possible if there is a personal relationship. Having your ECFMG certificate ready by the beginning of the application process in September will significantly maximize your number of interviews and give your application the priority over other IMG applications. In order to get your ECFMG certificate by September, you may have to take your last USMLE exam up to 3 months before September, as the results take time to be released. Always check the result reporting period for the exam before you schedule it. For example, you must take your Step 2 CS exam between May 20 through July 14 to have your results reported before September 12, according to this SITE.